Mal pua is the traditional Raksha Bandhan recipe. From early morning, preparation for making mal pua begins. 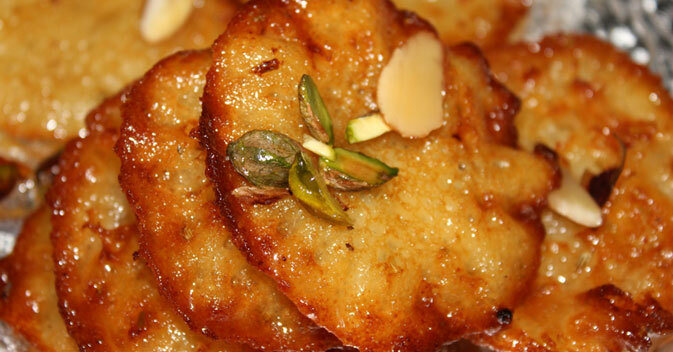 Mothers or sisters take the pain to make this delicious and mouth watering sweet dish. Brothers love to eat mal pua after they are done with all the customs and traditions of Rakhi celebrations. In a pan take water and add sugar to it. Boil this water for say around ten to fifteen minutes to make thick sugar syrup for mal puas. In another pan, mix sieved flour, sugar and water. Beat well and make fine batter with it. Let this batter stand for half an hour. In another wok, take oil and heat it. Take little of the mixture with a large spoon and slowly lower it in the heated oil. You must be very careful as to avoid any mishap. Moreover, you should also be careful that the oil is properly heated else the batter will stick to the bottom. Fry the mixture until golden brown. Once it is done, pour this fried mal pua into the sugar syrup that you have made. After a couple of minutes bring it out. You can garnish the sweet dish with cardamom powder, cream and rose water for essence and sweet flavor. Your mal pua is ready to be served.